Italian road racer Dario Cecconi's remains were escorted around the Tandragee 100 circuit by motorcyclists and fans during a tribute lap on Thursday night. A tribute lap in memory of Italian racer Dario Cecconi was held on Thursday night at the Tandragee 100 course where he lost his life in a crash last Saturday. A hearse carried the 38-year-old’s remains on one final lap of the 5.3-mile circuit he loved so dearly. An Ulster flag is draped on the coffin of Dario Cecconi during a service at the start line on theTandragee 100 circuit in Co Armagh. Hundreds of bikers and fans turned out to pay their respects. Mr Cecconi, from Livorno in Tuscany, crashed on the final lap of the Senior Support race. He was taken to Craigavon Area Hospital but sadly succumbed to his injuries and his death was announced on Tuesday night. His friend, Marta Coviola – who runs the Italian motorcycling website Road Racing Core – attended the tribute lap and told the News Letter Dario loved Northern Ireland and Tandragee especially more than his own hometown. 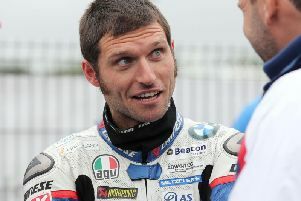 “I’ve known Dario since 2011 and I met him in person for the first time in 2012 at the North West 200. He was where the Italians were parked in the paddock and Stefano Bonetti was there. He was always full of news for me,” she said. A chequered flag is waved as the hearse carrying the coffin of Italian rider Dario Cecconi crosses the finish line during a lap of honour at the Tandragee 100 circuit. “He came six times to the Tandragee 100 and two or three times to the North West, or more. Also Killalane and then the ‘Ulster’ last year for the first time, which was one of his dreams. Another dream was the Southern 100 but he didn’t go there. “In 2010 he decided to come here because he loved Northern Ireland. He was never into short circuits or anything. The Manx was another dream but he didn’t have sponsors or anything for money. He was not able to ask for money! Marta learned the seriousness of Dario’s injuries almost immediately as she acted as a translator for those who had accompanied him to the hospital. She has vowed to attend the Cookstown 100 this weekend after booking her trip some time ago. Although she admits she was unsure whether or not to go to the race, she feels it is what Dario would have wanted. “Unfortunately I heard the news straight away because I was a translator for the people who were in hospital with him and also Francesca [Benvenuti, Dario’s partner] and Luca [Dario’s brother]. “We had a group on Facebook and I was constantly translating from English to Italian. It was very hard, unbelievable,” she said. Marta’s brother, Nicola, said he was moved to see so many people turning out to say a final farewell to Dario.